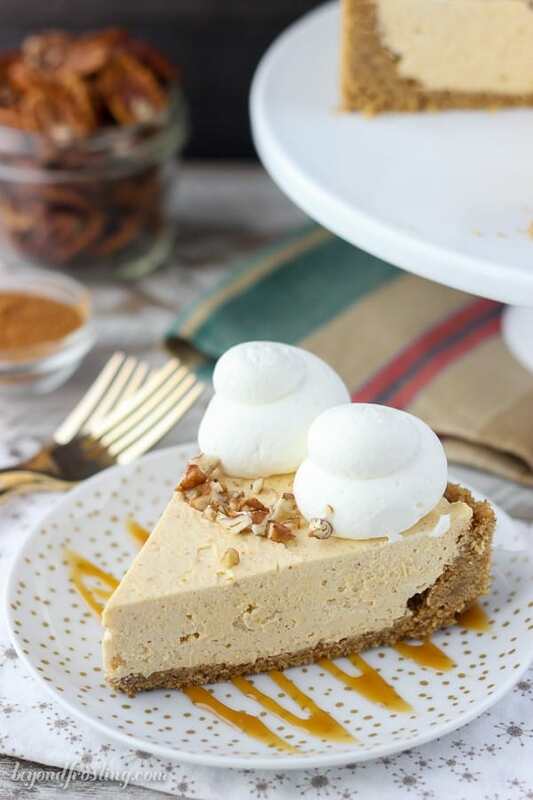 Perfectly smooth and creamy, this No-Bake Pumpkin Mascarpone Cheesecake is a pumpkin cheesecake with mascarpone cheese & whipped cream with a buttery graham cracker crust. How much more pumpkin can you guys handle? I’ve been trying to mix it up with a few different recipes in between but let’s be real, this is my favorite time of year! 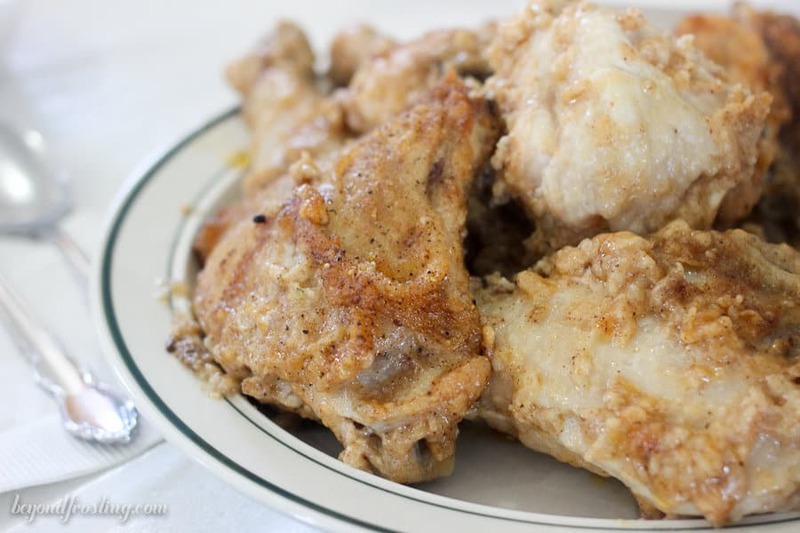 Luckily for you, this recipe is quick, simple and down right delicious-oso. I thought you might need another excuse not to bake this holiday season. 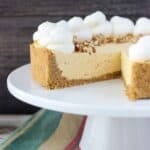 This No-Bake Pumpkin Mascarpone Cheesecake was originally a recipe I wrote for my cookbook, but I decided to save it to share just with you guys. 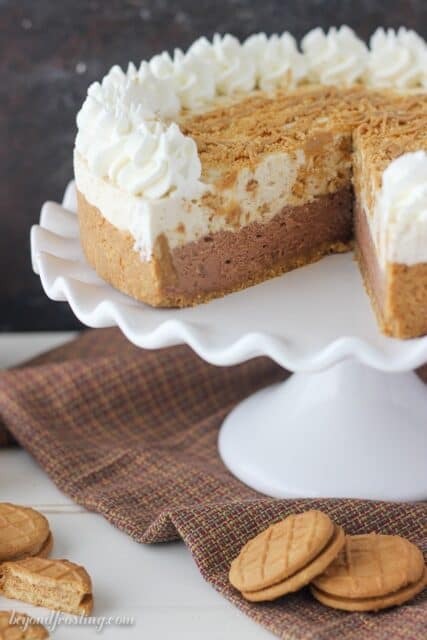 The texture of this no-bake cheesecake could not be more perfect. I definitely prefer to use mascarpone cheese because it let’s the pumpkin flavor shine though. You don’t get the same tangy from a traditional cheesecake. I’ve also found that mascarpone whips up to make the most amazing mousse. It’s thick but airy and fluffy. That’s exactly what I wanted for this filling. 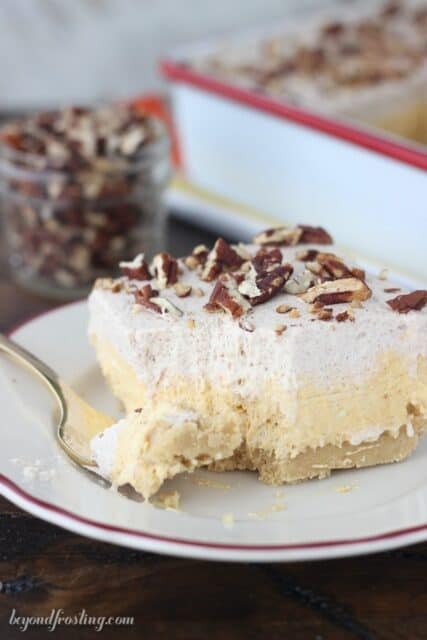 These no place for Cool Whip here, so grab some heavy whipping cream and lets get started! 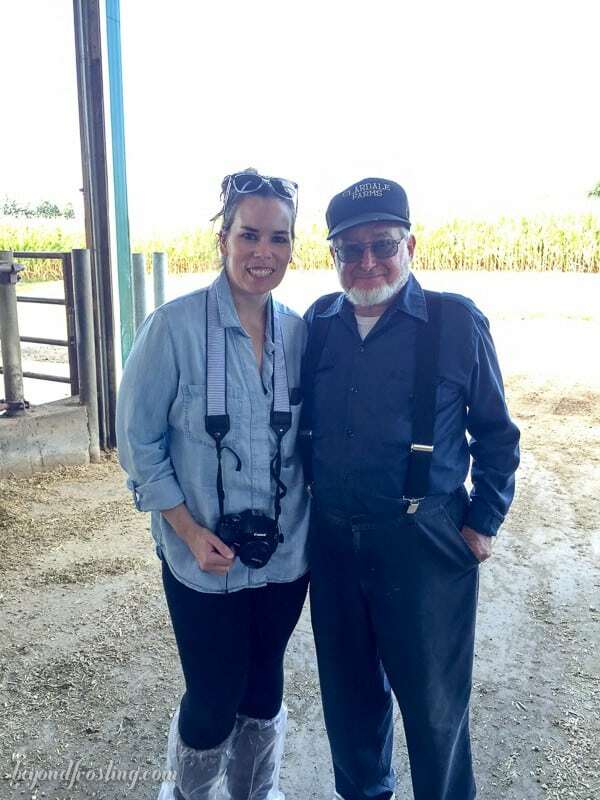 Speaking of cream, I wanted to tell you guys a little bit about a recent trip I took to Ohio with the American Dairy Association Mideast. 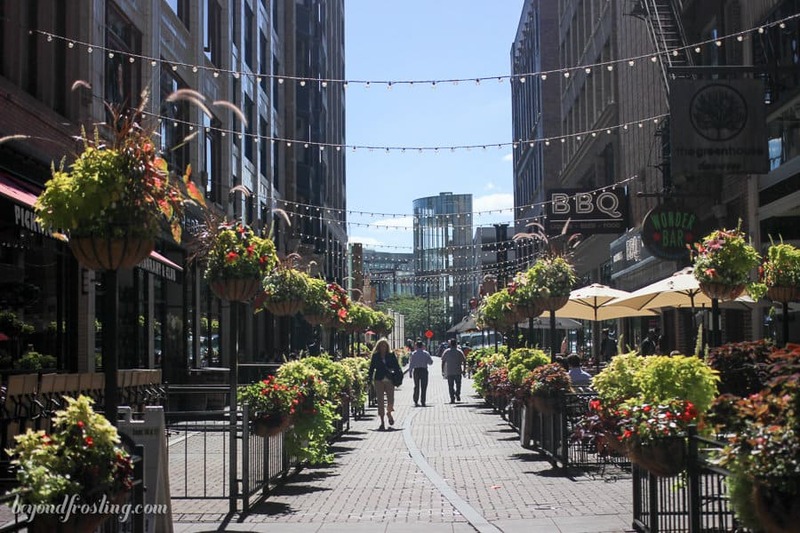 If you follow me on Instagram, you might have seen I was everywhere from Cleveland to the farms, to Amish country and even to the Cleveland Browns stadium. The trip started off in Cleveland at the Hyatt Regency Cleveland. We were wined and dined and stuff full of delicious cheese. I’ve never been great with wine, but it was really fun to pair them together. Not so oddly enough, my favorite pairing was actually with the beer! 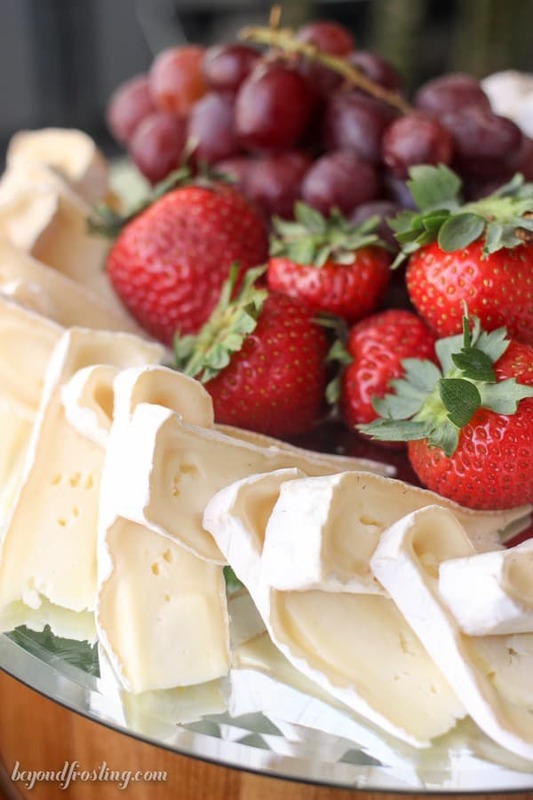 I did learn that you should always taste the wine first because the butterfat in the cheese will coat the inside of your mouth and completely change the flavors of the wine. If there is one thing I love to learn about, it’s where my food comes from. In fact, this is the third farm trip I’ve been on. Growing up in Vermont, I’ve always been surrounded by farms and fields but it’s a bit different when you get to spend some time with the farmers and animals themselves. One thing that was made very clear to me is how much the farmers truly care about the healthy of their animals. 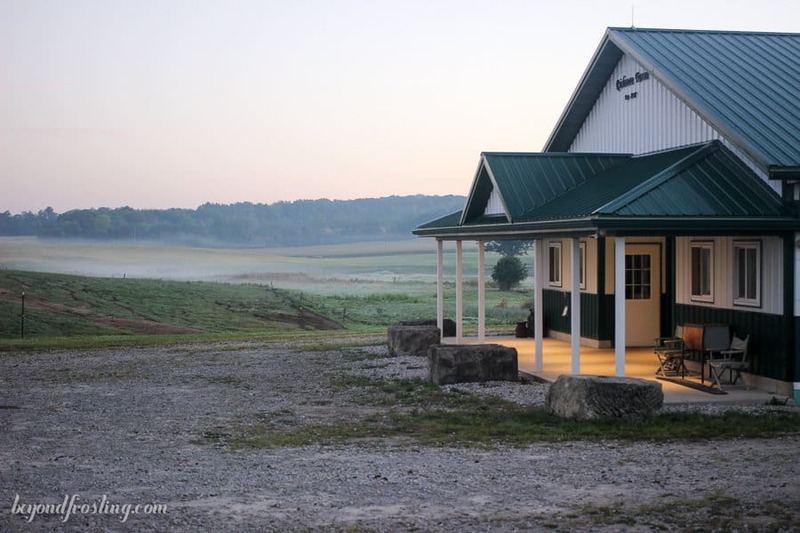 Whether is was the family owned Richman farms with 80 cows or the 5th generation Claredale farms which has about 700 dairy cows, most of our time was spent learning how the farmers keep the cows fed, cozy and healthy. After all, they are producing milk that we are all drinking. I am no stranger to dairy either, and if you’ve read my blog for any amount of time, you probably know that already. 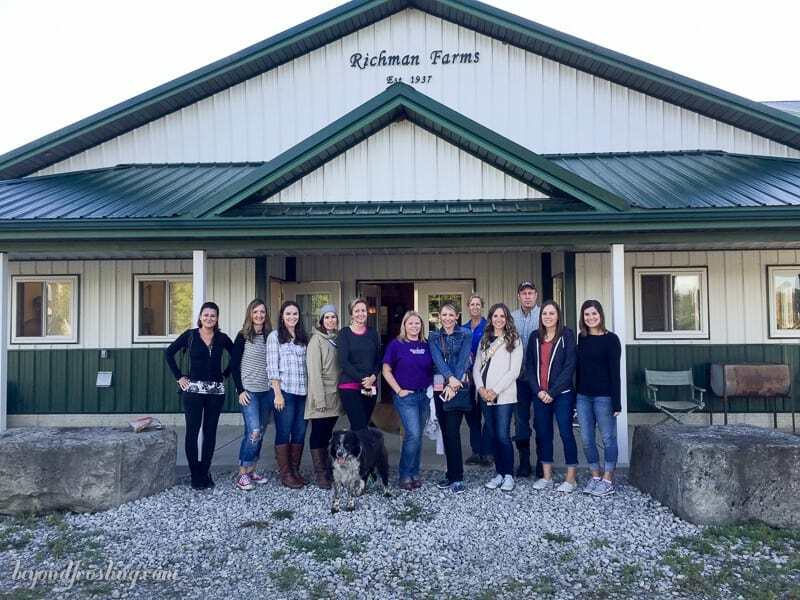 Our day started bright and early at Richman farms where we got some first hand experience milking the cows. Do you wanna see exactly just what we saw? Check out this fun video.The cows were really curious who all was hanging out that day. They loved to lick our hands and smell our jackets. I was really touched by the story of how the Indoe family faced challenged when a tornado ripped through their farms years ago. Luckily, no humans or animals were hurt, but the entire community came to help them rebuild and clean up after the tornado had passed. We continued our day driving through the very curvy Amish country roads. I could seriously stare out the window all day long. Despite feeling a bit ill from the bus ride, I was amazing to see the Amish farming their land, driving their buggies and watching all the kids run though the yard. We continued our day driving through the very curvy Amish country roads. I could seriously stare out the window all day long. Despite feeling a bit ill from the bus ride, it was amazing to see the Amish farming their land, driving their buggies and watching all the kids run though the yard. 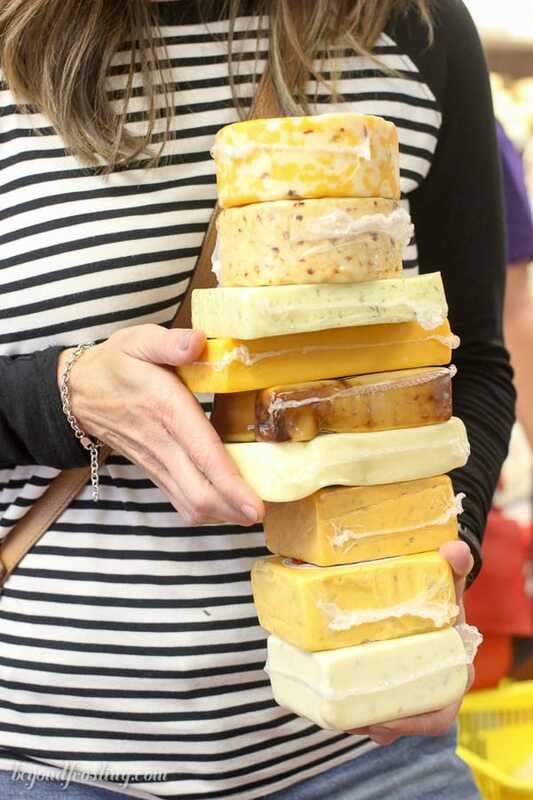 Next, we were spoiled at Pearl Valley cheese learning about how the dairy is processed and made into cheese. I even got to taste some Swiss cheese that was straight from the wooden barrel. From there we headed back into Amish country for a traditional lunch: fried chicken, brown butter mashed potatoes, noodles, green beans and plenty of pie. OMG the pies, I can’t even. I just want to hang out for a day and learn all their secrets, although I think it involves butter. We ended our tour at Claredale farms. Here we learned a lot about calf care. I think there tends to be a misconception when you see those calves in the little individual pens. 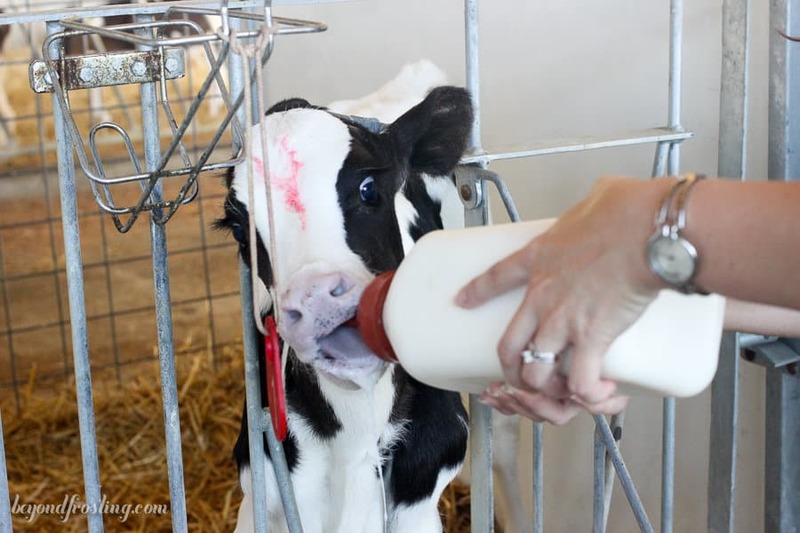 You might think they are being raised for veal, but that’s not the case with dairy cows. The calves are separated from their mothers after about 24 hours for multiple reasons. It is actually much safer for the babies. If you think about, the mamas weigh well over 1000 pounds. Could you imagine if they sat on the calf? Keeping the babies in the individual pens is much healthier for the babies. 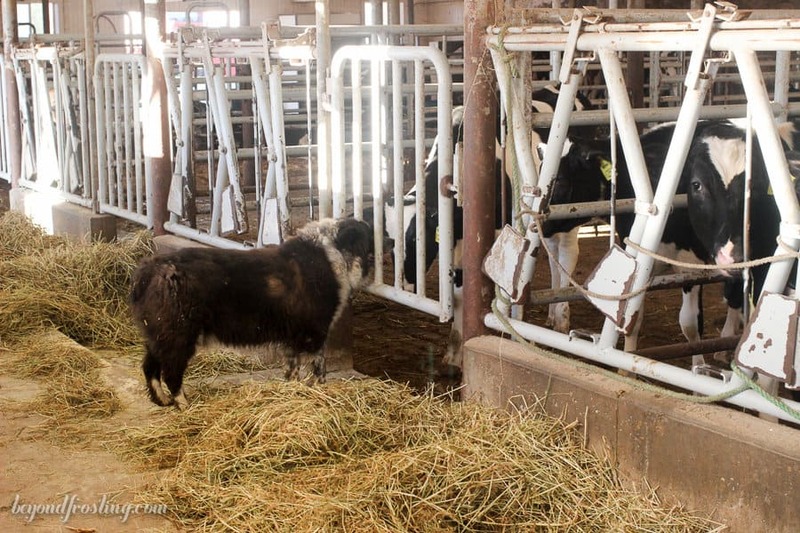 They are protected from disease and the calves can receive the individual care that they need. We even got to bottle feed them! At Claredale farms, after the babies are graduated from the individual houses, they are grouped together by age so they can grow together and get the necessary care. The babies are fed using a Bluetooth monitor, which I thought was so neat! 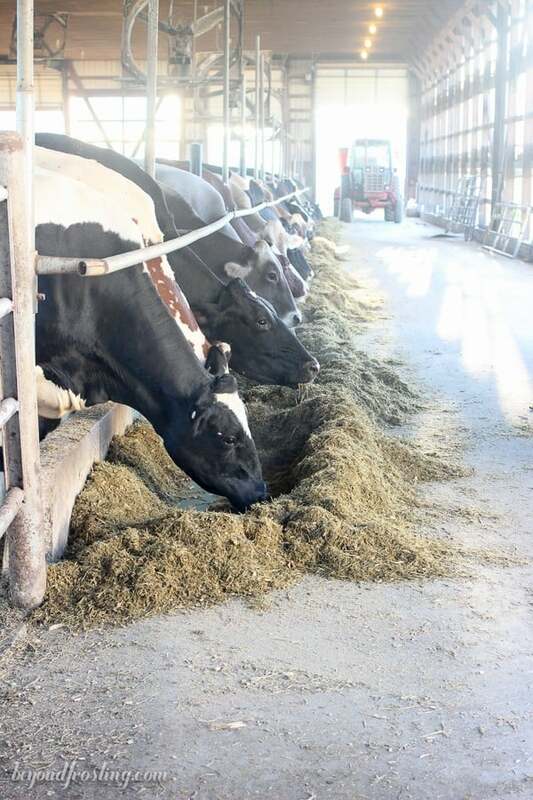 They can provide as much milk as the calf needs, see how often it feeds and monitor it’s health using this system. 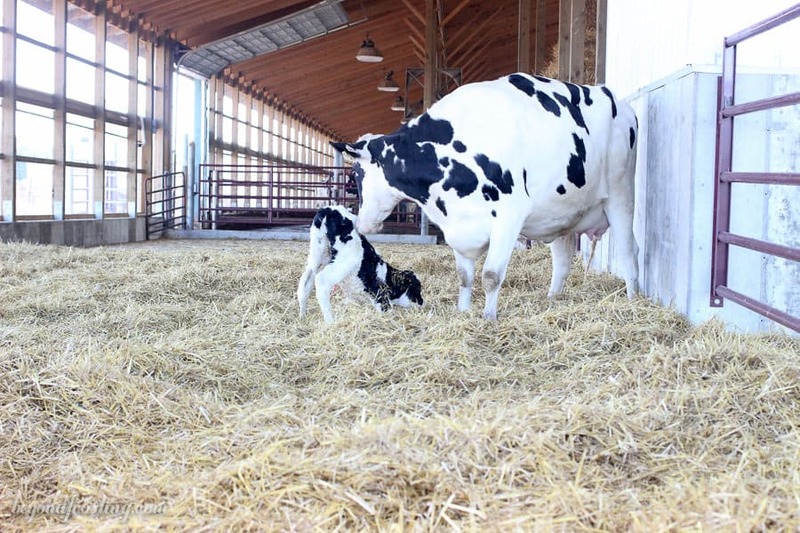 While we were visiting Claredale farms, we even saw a calf being born. It was amazing and disgusting at the same time. I am just keeping it real. We weren’t right there front and center but lets just say we saw the beginning stages and returned after the calf was out. We even saw her take her first steps. I could have spent all day at the farms learning about farming. They are just so passionate about their work, and let’s face it, farmers never take a day off. The cows have to be milked 2-3 times a day and there’s always plenty of work to be done. 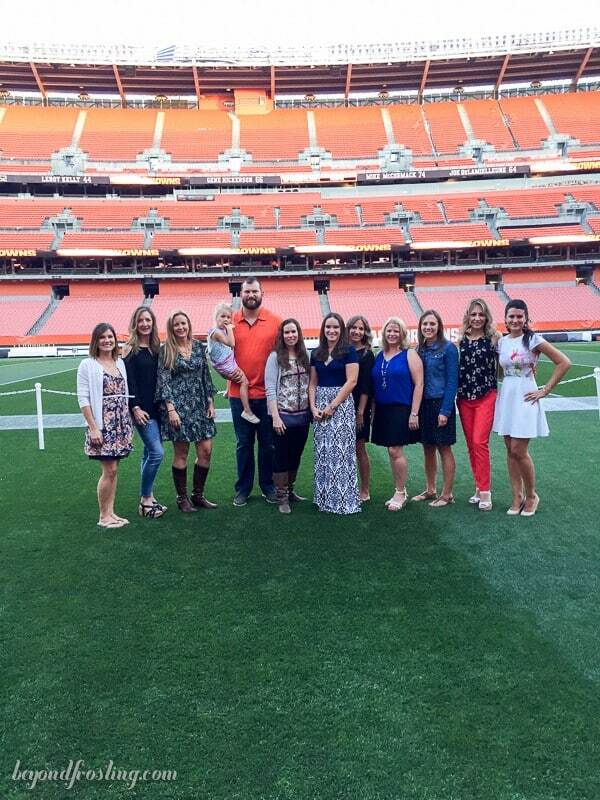 After a day on the road, we headed for a private dinner on the sideline of the Cleveland Browns stadium. What a unique experience this was. We were joined by Joe Thomas, a tackle for the Browns. Joe is a partner of Fuel Up to Play 60, which is a program to help educate kids about being active for at least 60 minutes a day. 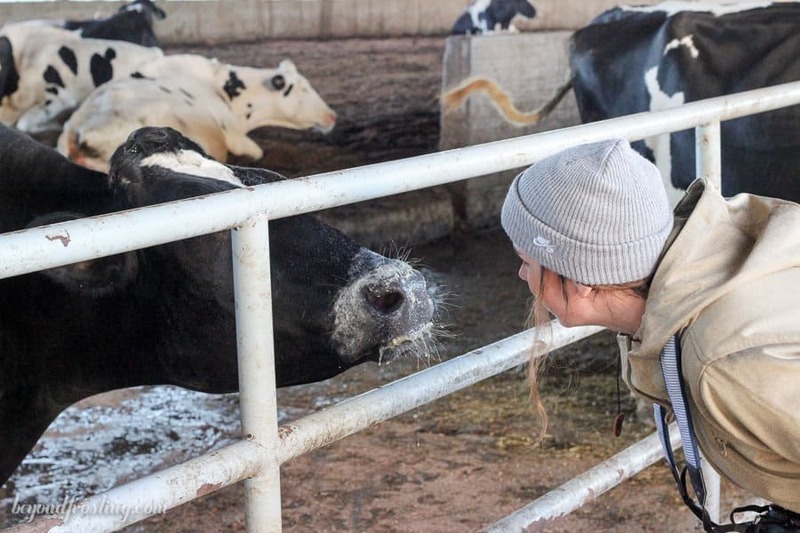 They learn to pair their activities with plenty of nutrition, which of course includes dairy. The next morning, we got the pleasure of having breakfast with the students at Glendale Primary School. 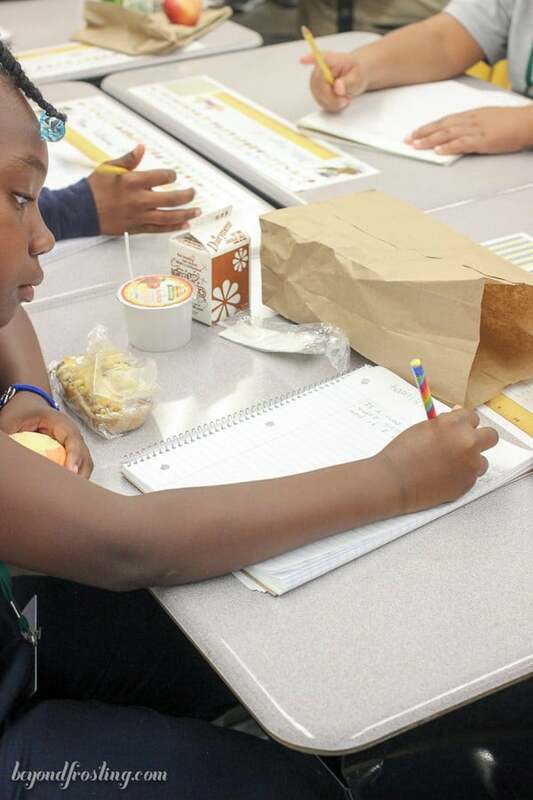 Did you know that kids that eat breakfast are more likely to be focused during the day? These kids have the option of having breakfast in the classroom while they are preparing to start their day, which in turn teaches them about proper nutrition. 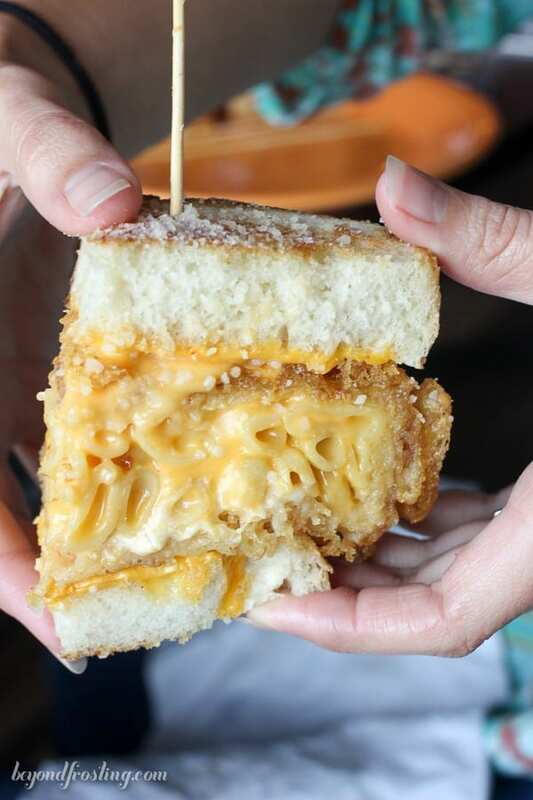 Before we took off, we were literally stuffed full of grilled cheese at Melt Bar and Grill. 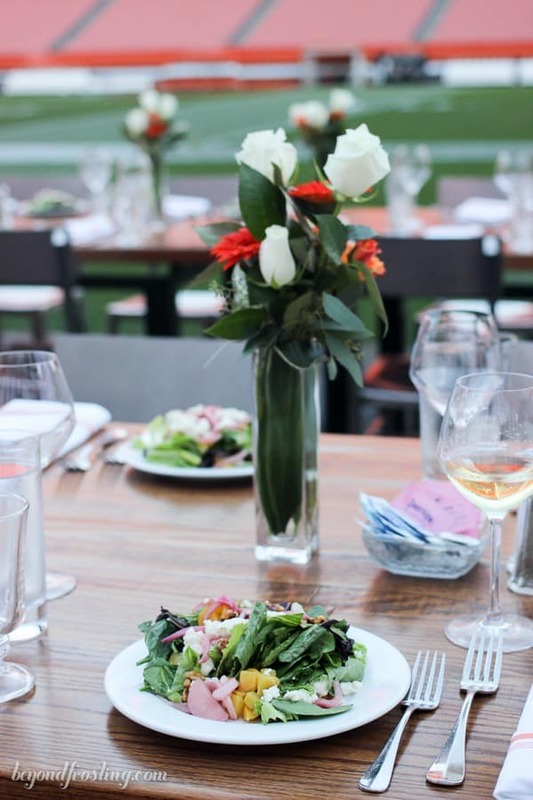 We heard all about Chef Matt and his passion for craft beer and good cheese. It’s like we were meant to be best friends. 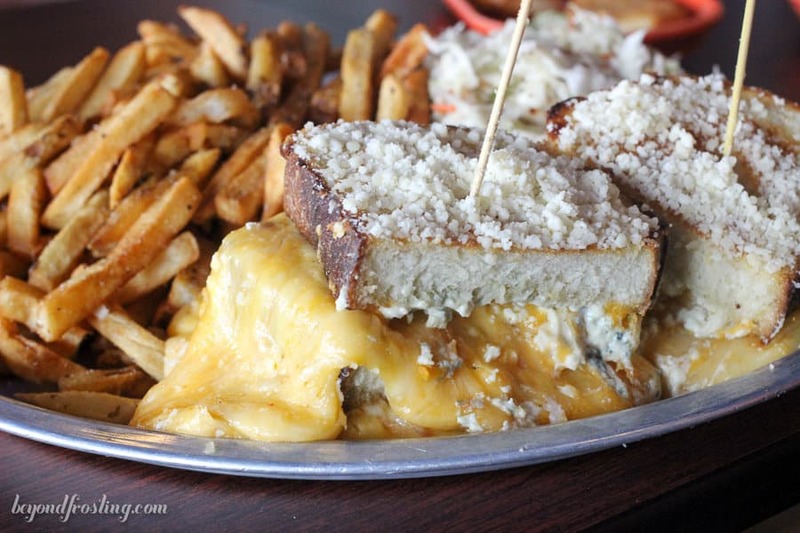 Melt was even features on an episode of Man vs. Food because they have the melt challenge. I’ve got way more to share with you from Melt, but I’ll let a couple of the photos speak for themselves. In fact, I have so many photos, I am going to be sharing more of them in a separate post. 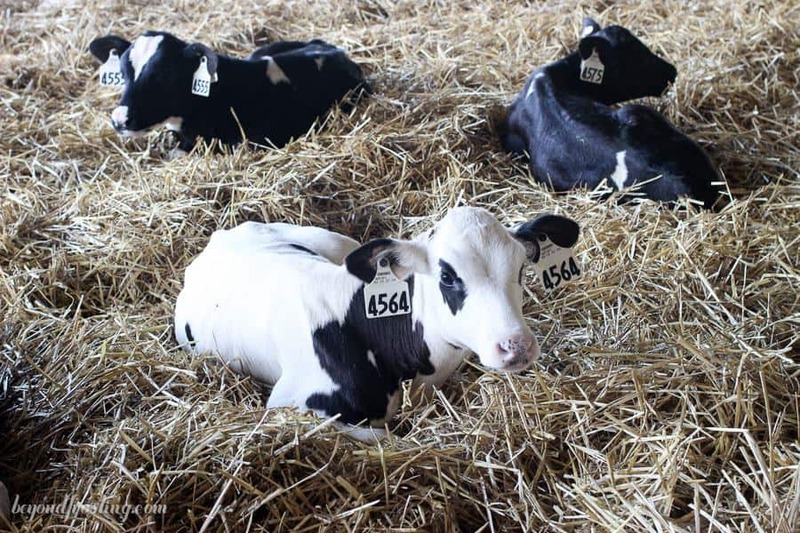 I actually have loads of information I want to share with you about dairy farming, but I also thought it would be helpful for you to have some information from the American Dairy Association that might answer some of your questions. If not, please do email me or leave me a comment so I can get your questions answered. While the ADA Mideast team invited me and covered my expenses for the trip, writing this post was not required. I really just wanted to share my adventure with you. A special thanks to the ADA Mideat team, the Indoe family of Richmond Farms and Frank Burkett of Clardale Farms & the Cleveland Browns for hosting us. For the crust: Line the bottom of a 9-inch (22.8-cm) springform pan with parchment, wrapping around the removable bottom of the pan. Grind the graham crackers into fine crumbs using a food processor or blender. In a microwave-safe bowl, combine graham cracker crumbs with unsalted butter. Microwave for 45 to 60 seconds until the butter is melted. 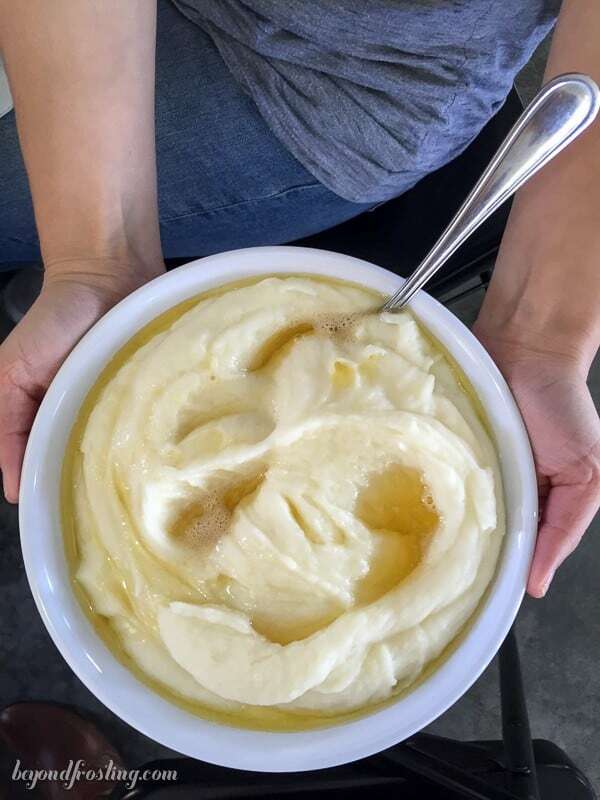 Stir the melted butter into the crumbs until there are no dry crumbs left. Pour the crumbs into your springform pan and press firmly into the bottom and up the sides of the pan to create a thick crust. Refrigerate the crust while you are preparing the filling. For the filling: Place mixing bowl in the freezer for 5 minutes to chill. Beat the mascarpone at a low speed, slowly adding heavy cream (scrape down the bowl as needed) until mascarpone resembled a liquid mixture and add all remaining heavy cream. Increase speed to medium-high beating until cream gets bubbly. Slowly add the powdered sugar, brown sugar and pumpkin pie spice and continuing beating until soft peaks form. Slowly add the pumpkin puree and continue beating until stiff peaks form. Pour the filling into the prepared pie curst. Cover and refrigerate 6-8 hours. For the topping: Place mixing bowl in the freezer for 5-10 minutes to chill. Pour heavy cream into chilled bowl and use an electric mixer to beat heavy cream on medium-high speed until cream gets bubbly. Slowly add powdered sugar and continuing beating on high speed until stiff peaks form. 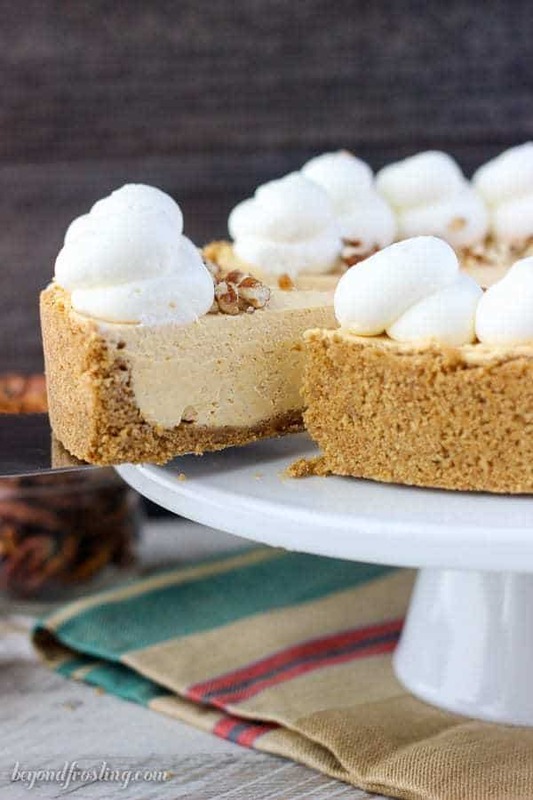 Pipe whipped cream along edges of the cheesecake using a large open round tip. Sprinkle pecans along the inside edge. Cooking time is refrigeration time. Hi Julianne, I hope your still checking your older post. Love your cheesecakes have made many of them. 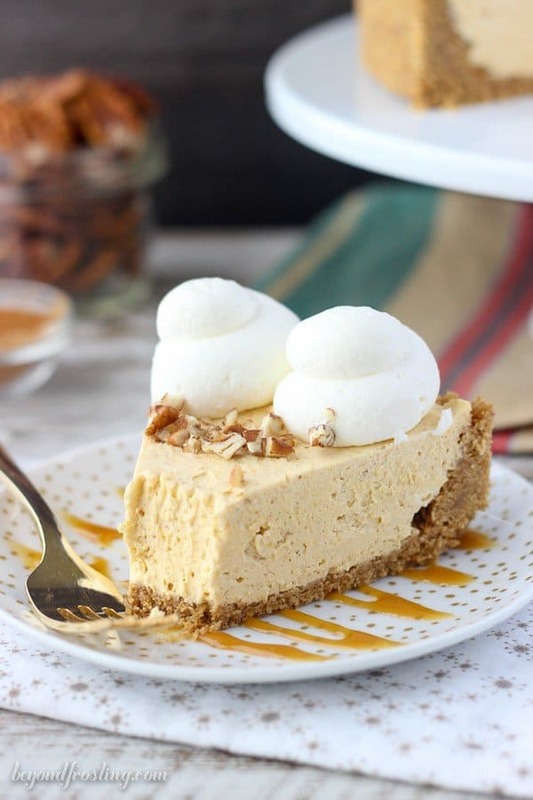 And this one looks delicious also, but I have a lot of cream cheese and was looking for a no bake pumpkin cheesecake for Thanksgiving of course I checked you blog first. But only found this one do you have one for pumpkin cheesecake with cream cheese and my pan is a 10 inch springform pan. Thank you for all the wonderful recipes. Hi Debbie. I sure am! I think you would be fine to substitute this recipe with regular cream cheese. 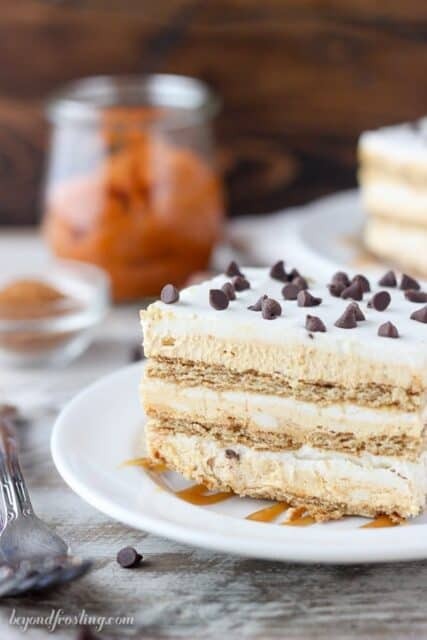 Love the recipe and this looks like an amazing trip! 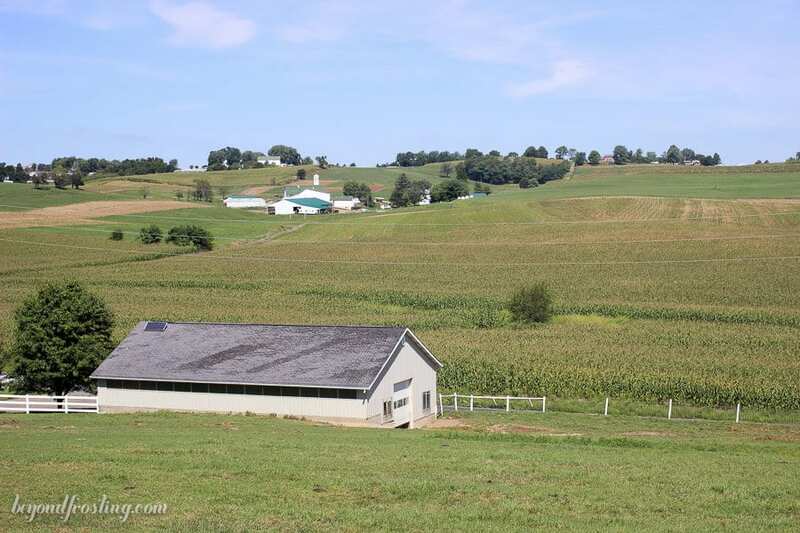 I grew up in Vermont too–on a dairy farm! Oh that’s awesome! I love that! I just made this. So easy! So far, I’ve only tasted the filling and now it’s chilling for my dinner party tomorrow, but I think it’s perfect. Not too sweet or spicy. Not too much pumpkin but enough of a hint for pumpkin fans. I think everyone will be asking for the recipe! Thank you! Awesome Lynz!! I am so glad! The trip sounds like so much fun! And this cheesecake sounds incredible! What a great trip! I loved seeing the social posts earlier and great to hear more now. 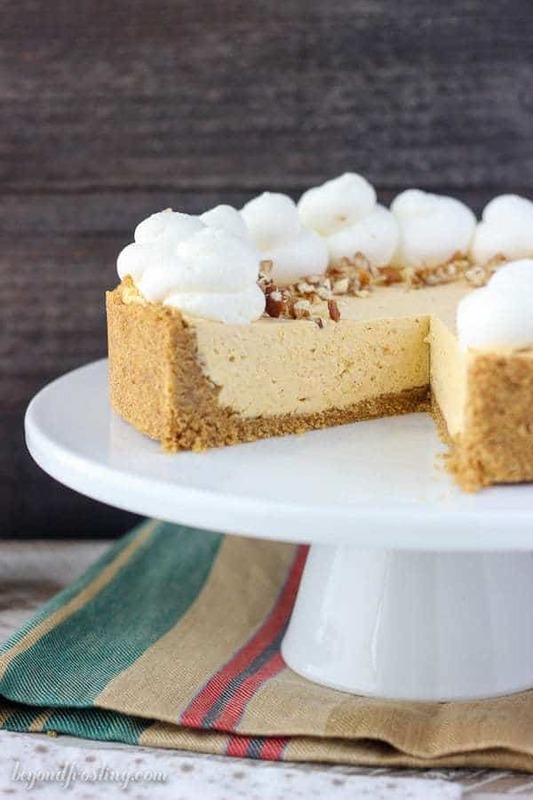 And so glad this one was saved for us…pumpkin and mascarpone sounds so delicious!! This sounds like a great trip – great photos too! And I am SO making this recipe. OMG this cheesecake! I can see why you saved it – I WANT! 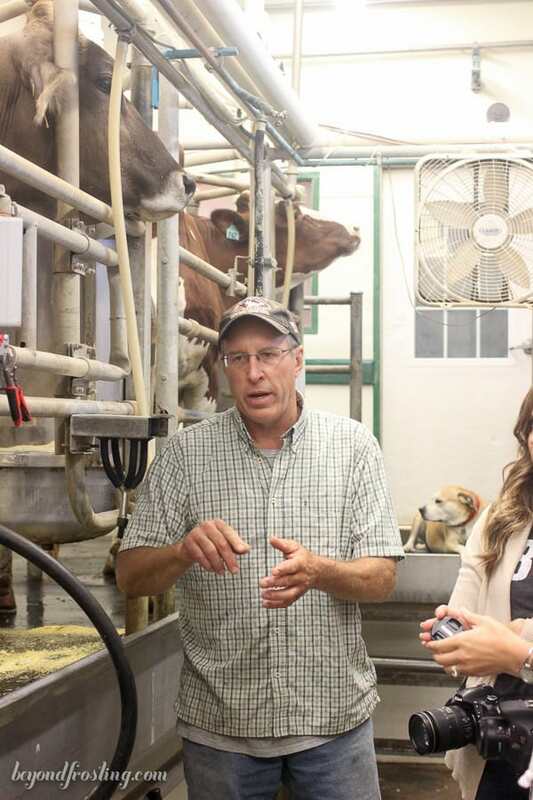 The dairy trip was so fun and we learned so much – great recap! That trip look so fun, all that cheese, sign me up! 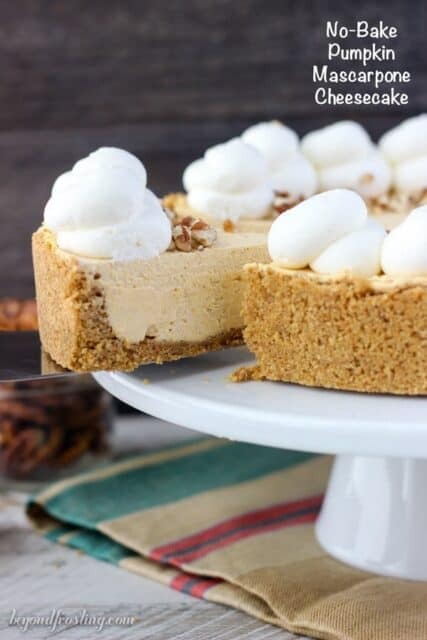 Love this no bake cheesecake, so pretty! I hope to see those plastic booties this weekend. What a fun trip! And the baby cow, come on!!! 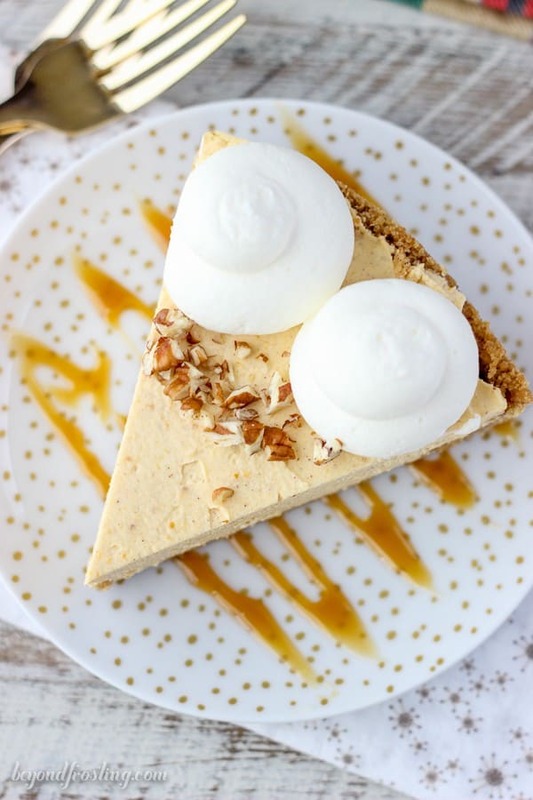 This cheesecake looks so good! Bring on the Fall.